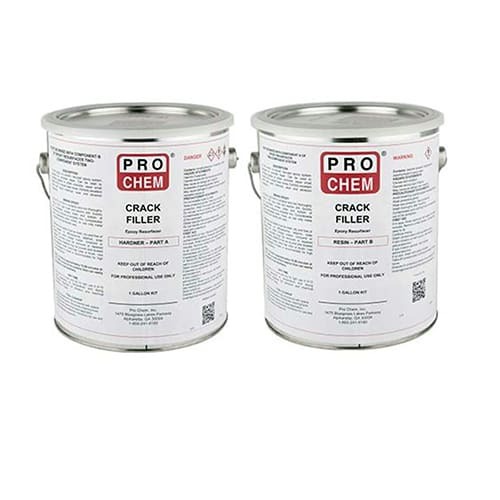 Crack Filler | Pro Chem, Inc. This two-component, clear epoxy coating is specifically designed as a resurfacer for pitted, spalled, cracked or damaged concrete. CRACK FILLER is also an excellent heavy-duty chemical resistant coating for long-term protection of concrete surfaces. 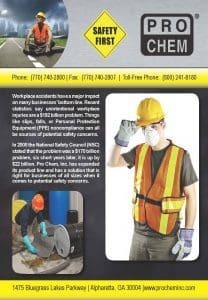 It exhibits excellent clarity with good chemical wear and abrasion resistance. Thoroughly clean and rinse floors. Floors must be dry and free of all dust, soils and other foreign matter. Add Part B into Part A container and mix thoroughly using a “Jiffy” type mixer mounted on an electric drill. Scrape sides and bottom of container. Mix for 3-5 minutes. Pour mixture and spread evenly onto surface. Crack Filler can be applied using a squeegee, roller or trowel. WARNING: Considerable heat may be generated upon mixing components. Wear gloves when handling. Pot life is approximately 15-20 minutes at 75°F. Mix no more of the material than can easily be applied in that time frame. DRY TIME: Tack free in 2-3 hours at 75°F and dry for light use in 8-12 hours depending on temperature and drying conditions. Reaches full abrasion and chemical resistance in 7 days. TOOL CLEANUP: Tools and equipment may be cleaned with xylene before pot life expires.